It seems you can’t open a health and fitness magazine now without seeing a mention of the spice of the moment – turmeric. It has long been a staple in Indian cooking and ayurvedic medicine, and little wonder with it boasting properties such as being an anti-inflammatory and anti-oxidant, as well as being reported to aid in warding off diabetes, strokes and even cancer. 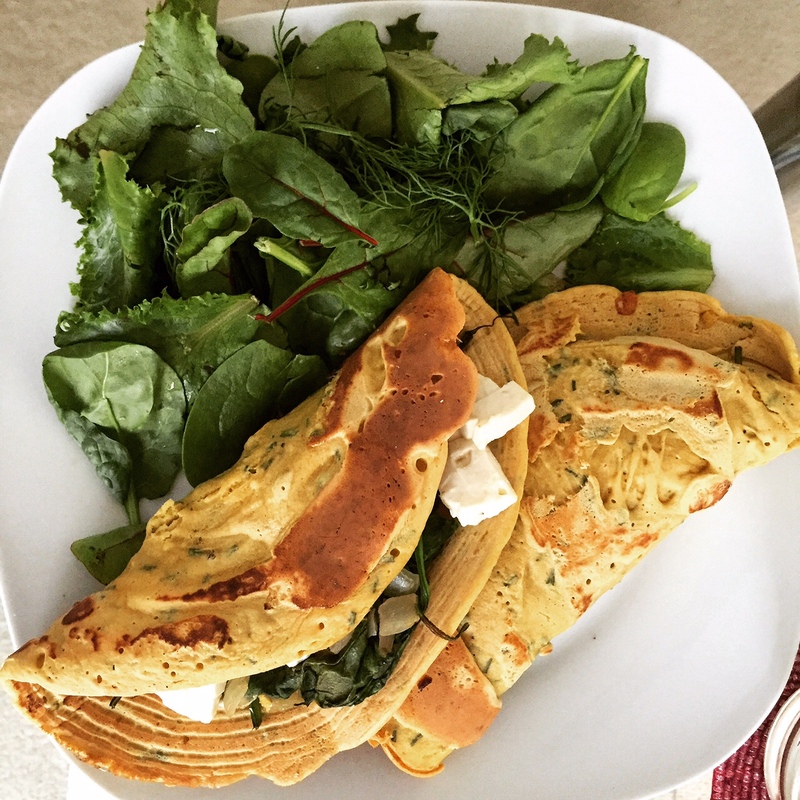 I therefore wanted to create a recipe that used the power of this mighty spice (that wasn’t a curry) so I therefore present to you my chickpea pancakes stuffed with spinach and feta. In a large bowl mix the flour and spices, and then season with salt and pepper if desired (I used Himalayan pink salt). Add in the beaten egg and then slowly add in the water until a pancake batter consistency is achieved. Stir thoroughly to remove any lumps in the batter and ensure it can be easily poured into a frying pan. You may need a little more or a little less water – hence add it gradually after the egg until you achieve the batter consistency. Leave this mixture to settle whilst you prepare the filling. Gently sautée the onion and garlic in coconut oil, do this slowly so as not to burn them and keep the flavour in. Once the onion is almost cooked (this should take around 8-10 minutes) stir in the spinach until it starts to wilt, season to your taste – you could add nutmeg, chilli, salt and pepper, or even ghee for an authentic Indian flavour. Take the pan off the heat so that the spinach does not break down too much. Chop the cheese into small cubes and set to one side. In another pan, add a little more coconut oil and one by one cook the pancakes. Do this by spooning a large ladle full of batter into a hot pan, once bubbles form on the surface you can flip the pancake over. This mixture should make 4-6 small pancakes, when one is cooked pop it into a warm oven to keep it hot whilst the others are cooking. Once you have made all your pancakes, remove from the oven, and then add the onion and spinach mix to each one as a filling, and before folding in half and adding the cheese on top, divided evenly between all your pancakes.